Creative Directors Yann Mabille and William McGregor joined forces with Zubi Advertising to direct Ford Fusion 'Changes'. 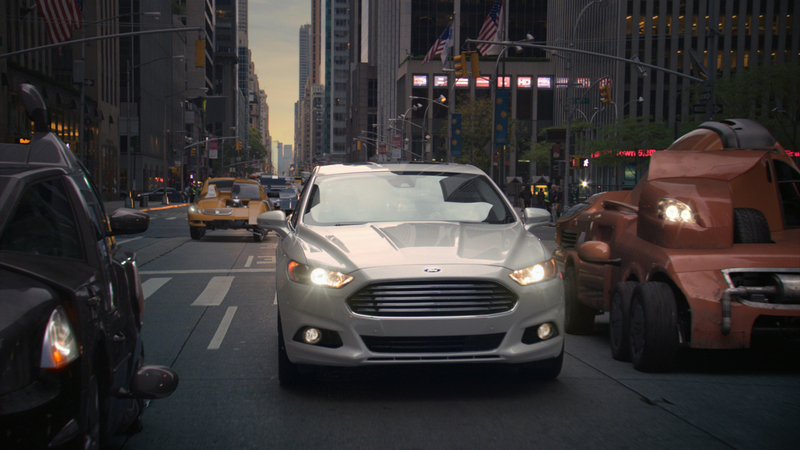 The spot follows the Fusion's journey through the streets of New York City where it finds its prime place naturally within this world, elegantly driving from early dawn hours to the mid-morning sunlight. Our team populated the city streets with strange 'Picasso' cars that are the antithesis of good design. The contrast between these cubist cars as well as the contrasting dark and light illustrate just how refined the Ford Fusion is. "The main challenge was the design of the Picasso cars" said Mabille. "Several different shapes and structures for the design of the cars were explored but we quickly realized that it was easy to actually create the futuristic bad designs. All the Picasso cars were created in CG and animated specifically to underline their lack of elegance. We also experimented with optics to add texture to the footage." The Ford Fusion car was shot mostly on empty streets over two days which then allowed for the 'Picasso' cars to be recreated in CG and composited back into the live action. Mabille and McGregor wanted to push the idea of distortion, not just with the 'Picasso' cars but also with how the piece was shot. They used different pieces of glass and reflections to distort the light, the image and motion and create interesting in camera effects - the end result was a commercial that pushed not just the expected CG the Mill is so well known for but also pushed the tools of filmmaking.